The latest addition to Milwaukee’s Circular Saw line features a patented adjustable main handle that provides users with maximum control and comfort. The handle position can be moved for the best ergonomic grip. Both front and rear handles have cushioned grips. A QUIK-LOK® cord with a positive lock system, makes field replacement of the cord set easy and fast. A small button on the saw ensures positive lock. The power assisted brake stops the blade in seconds to repetitive cuts. 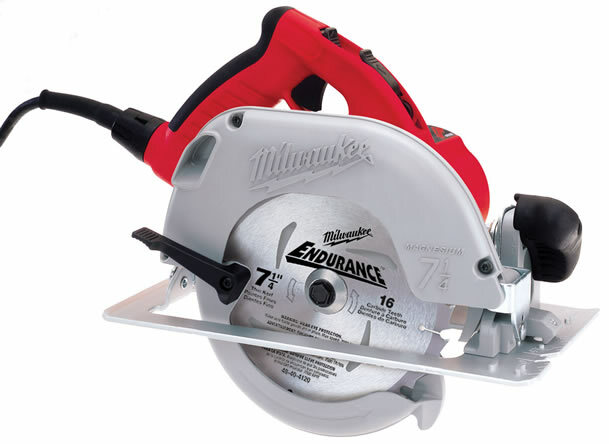 At 10.6 pounds and featuring a powerful Milwaukee built 15 amp motor, this saw provides the highest horsepower to weight ratio available in a 7-1/4 inch saw. An aircraft aluminum shoe resists bending. Easy to reach depth and bevel adjustment knobs allow bevels to 50 degrees.